As promised, here's a peek at the cover to our third issue. 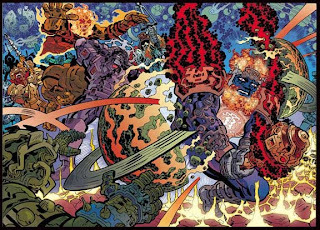 This one's pencilled by Godland's Tom Scioli - and if you know anything about the man, you might have a good idea of what the theme for this cover is. At any rate, the Yeti sure does look concerned...doesn't she? As you can obviously see, we're only in the pencil stage with this cover, but we've got lots of time before we need to see a final version, at least concerning printing and the like. Duane is currently in possession of this piece of art (the electronic version, anyway...), and he's in the process of inking it. Tom mentioned that he usually inks his own work, so this will be a different experience for him as well. I'm sure it'll look great when it's finished...heck, it looks pretty good right now. The past few weeks have been pretty exciting, as I've seen artwork continue to roll in as we inch closer and closer to releasing the book in stores. 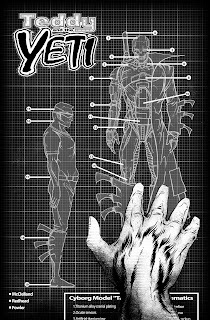 It's always fulfilling to see a creation come to life, and I know that Duane and I are both just as thrilled to see some great artists put their stamp on a few Teddy and the Yeti covers. 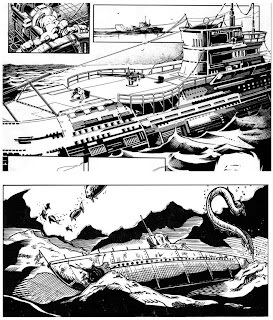 The clip you see to the left here is from our first issue. The pencils are done by none other than Phil Hester, a super talented guy whose work you might recognize from runs on Green Arrow and The Irredeemable Ant Man, to name a few. Duane showed us his versatility in inking and Karin did her usual bang-up job in the colors department. I'm just releasing a clip for now, but I'll show the entire thing soon enough. I've got another preview from the cover to the third issue coming up soon, but for now...marvel at the awesomeness that is this part of our first cover. Progress on Teddy and the Yeti continues to be made. Colored pages for the first issue are starting to roll in, leaving letters as the last piece of the puzzle to be...well, whatever you do with puzzle pieces. What I'm getting at is this: we're nearing the end. My good friends Brant Fowler and Adnan Virk are each contributing to the book in their own way with letters and advice, but I'm looking to take the bulk of the work on myself. This entails that I actually learn how to letter, which is no easy task, but I'm working on it. If nothing else, I spent a big hunk o' money on buying Adobe's Illustrator CS4 program, which is as daunting as it is wonderful. This is obviously time consuming, but I think that in the end, as long as I can get the hang of it, it'll be worth it. If I find out that I'm just not up to snuff, I'll take myself off of lettering duties - I don't want the product to suffer because of stupidity on my part - and hand those responsibilities off to someone else, but at least for now, it looks like I'll be adding that to my list of things to do. 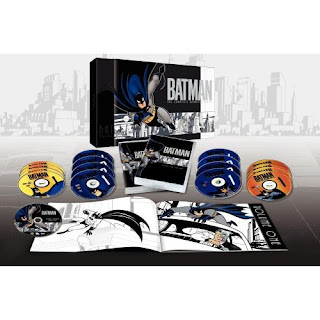 ...you could do worse than to pick up Batman: The Complete Animated Series. This show, along with Batman Begins, is one of my all-time favorite cartoons. Just the right about of drama and levity for me when I was...what, 12? At any rate, I had already bought the first two volumes, which have been made obsolete by this comprehensive set. This would normally irk me, as this is obviously a case where we as consumers are being milked for every last dollar we can spare, but LOOK AT THIS! It's got an art book and everything. Plus, I'm hoping to get it for Christmas, which costs me a total of zero dollars. And that's right up my alley. We'll wrap up our interview with Karin Rindevall today, moving from more Teddy-and-the-Yeti-centered questions to more general, and perhaps more personal, ones. I really can't reiterate enough what a great job Karin is doing on the book or how grateful I am to have her involved with this project. Karin has colored a short T&Y story for issue #3 and a backup "Andromeda Jones" tale for issue #1 (as seen above), is working on all the covers, and (if I can twist her arm hard enough) will be coloring flashback scenes for issues 1 and 2 in the very near future. I know I've said the before, but I'd put Karin's work against any other in the industry with confidence. But enough sucking up (for now) - let's get to the conclusion of her question and answer session. JM: Are there any artists you particularly admire, both contemporary and historical? KR: Well, one of the online artists that first got me into digital drawing was Emily Gregg. She mysteriously vanished back in 1999 with a simple "goodbye" message on her homepage, which was a really sad day for me. I wish she knew how much she inspired me, and how she got me into drawing. Another artist from that time that has kept on inspiring me until now is Vanessa Adams. Her pieces are truly something "more." They always have some sort of feeling or message in them. It's never just a drawing; there is always something to tell from her pieces. I don't really have any historical artists in mind. Don Rosa is truly fascinating, though, and I loved his comics when I was a kid (and still do). JM: When I think of Sweden, I think of yodeling and snow-capped mountains. How far from the truth am I? KR: I think you are far from the truth, but not entirely! I don't know of much (if any!) yodeling here. When I hear yodeling, I think of Austria or Switzerland (now *I* am probably far away from the truth!). And when I look out of my window, I see mountains but no snow (yet). We tend to get snow in November (October is we are lucky) and it disappears in March or April. In southern Sweden, the winters tend to be pretty wet and the snow doesn't really come to stay until January or February. But I do remember that we had more snow when I was a kid, but that could be because I lived more north [compared to] where I live now, and in a more mountainous place with huge valleys. Or it could be simply be that as a kid everything is "more", "bigger" or "longer" in that time span. I do know that winters in Sweden are longer and colder than in a lot of places - and during winters, the sun rises really late at sets really early. When a good friend of mine from the USA visited me back in 2005 to celebrate New Year's, she was really excited and pleased with the amounts of snow - but less excited about how short the days were (the sun came up around 9:00 am and went down around 3:00 pm). It's the other way around during the summer. Where I come from, it's only dark two-to-three hours during "midsummer's eve", and in Lulea (far north in Sweden) the sun never truly sets...which basically means the sun never really rises during "midwinter's eve". Pretty inspiring, huh? Even though I love snow and love to snowboard, I think the Swedish winters could get pretty depressing because of the lack of sun. JM: If you were stuck with one color (and all of its shades) for the rest of your life, and you had to use that color and no other, which one would that be? KR: I don't really know; it all depends on my "period" in drawing! Usually, since it is my favorite color, I would say 'blue', but I am kind of bored with that color right now. So I'll have to say 'orange'! 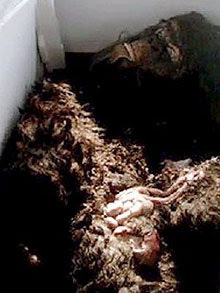 Karin Rindevall lives in Sweden, speaks more than one language, and colors Teddy and the Yeti. We met online some months ago and since then I haven't stopped being amazed at some of the work she does - and that's not just lip service. I would put her work on Teddy and the Yeti up against anyone in the industry today, and I'd feel confident in my choice...which is why I'm so very lucky to have her working on the book. I sent Karin a few questions about her work and her life, and what I received was unabashedly detailed and thorough. Because of this I'll split up this q&a into two sections, which just gives us all more to look forward to. I very well might publish some of this correspondence in an issue of T&Y, but for now, it'd be criminal of me to keep these to myself any longer. And so I give you the first part of a question and answer session with artist Karin Rindevall. JM: Tell me about your art...what are you working on now? You've done some colors for Teddy and the Yeti, but you have more on your plate, I'm sure. KR: Right now I am working on my own comic project called "Forsupen" - a plot based on a story I wrote when I was 13. It's a hobby project and since I am a full-time student, the progress is pretty slow. Forsupen means "drunken" in Swedish, in a somewhat "abandoned/fallen" kind of way. The comic's story is really wide and follows a lot of characters from casual everyday problems to really critical issues like surviving in war. It begins with a man with alcohol problems, which is why I used the word "Forsumen", because the word is old fashioned and fascinates me. Aside from coloring Teddy and the Yeti, I am taking on other freelance commissions once in a while. Sadly, I don't have much time to draw on other projects than [those] these days because right now I try to focus a lot on my studies, so I am trying to stick to coloring Teddy and the Yeti and working on one or two other commissions. Usually I am the multitasking type - I like getting involved with as many projects as possible! JM: So you study art in school? KR: I am not entirely an art student. I study a game graphics program, specializing [in] animation. I love to animate! I went to a 2-D animation college where I developed a lot of my artistic skills before entering the University of Skovde. Within the university's courses, I take part in projects that develop games in real development settings (six-eight hours a day). Thus far I have been part of four different game projects during my time at the university, one of them being "official", and my current fifth project soon to be official/commercial (in a year). I will graduate in May and hope to be able to use my artistic talents within a game development team really soon! JM: What's the process that you go through while creating your art? How much of what do you depends on technology and how much, if any, is by hand? KR: When it comes to coloring Teddy and the Yeti, I am working entirely digitally. I work in Photoshop, which is standard for me when it comes to work in high resolution (like comics). Even though I have been working digitally since 1998, I haven't learned until recently that it is very important to use references for coloring to make it look more "real". This is important even if you don't necessarily want [the artwork] to look photo realistic because you can learn a lot from studying colors, shading, highlights, different mood settings, etc. - even if you intend to color or draw in a cartoony way. As an artist, I actually started digitally and learned to respect and handle natural mediums after that. Computer graphics and art fascinated me as soon as I got the Internet, and I started experimenting with it way before I practiced to use real pencils and brushes. Things I learned in digital drawing were really useful for me when I started to paint on real canvas - like how to blend colors by hand by remembering the RBG values and how to mix layers in Photoshop and such. Traditional mediums were not really appealing to me before I learned to paint on the computer. JM: So which do you prefer? Computer-mediated or traditional? KR: If someone would ask me to pick computer tools or traditional tools when it came entirely to drawing, I think I would have to pick traditional tools because there is just something about them that you can never achieve on a computer (the feeling of it?). However, this choice all depends on what period I am in, because sometimes it's easier to sketch and color on the computer and sometimes it's easier on paper. I am also very dependent on the computer because it's so easy to find references for colors or objects/creatures I need to paint. And these days, since I work a lot in 3-D, I could never live without a computer. JM: What do you like best about the creation process? KR: The freedom in storytelling. Don't get me wrong, I love to write as much as I love to draw, but when I find a really, really amazing piece of art, I could really agree to the phrase "a picture could tell more than a thousand words." One of the moments I like the best about creating art and comics is the moment I can achieve something [in relation to] that phrase; to show something other than simple colors and a motive in a piece - to show a story - to show something that means something to someone else, even if it means something different than it meant to me creating it. 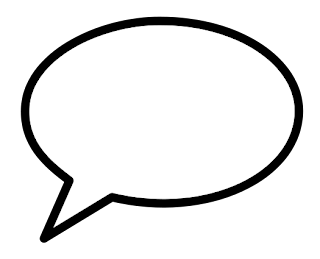 JM: What's your level of involvement with Teddy and the Yeti? KR: Right now I do all my best to color the pages of Teddy and the Yeti. I have a pretty tight schedule, but I always enjoy coloring and I think working on Teddy and the Yeti is a good way for me to develop my coloring techniques. 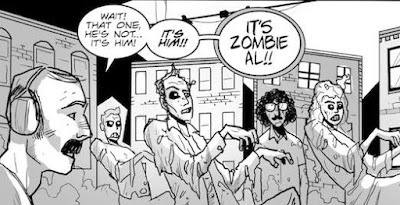 I get to work with other professional comic artists and that is a great experience for any artist, I think. I'll stop there for now...the remainder of the interview will be posted in the next few days. Be sure to check out Karin's website at http://www.karrey.com! 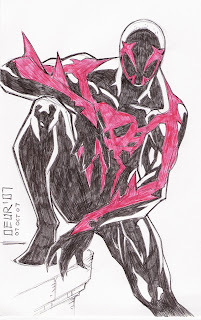 Here's a sketch of Spider-Man 2099 that my buddy, the enigmatic "Artboy_X" (mysterious!) drew for me last year. The man is returning to the states in just a few weeks after spending a year in South Korea as part of his Army training. It seemed appropriate to post this now. How flexible you must be, Miguel O'Hara! What's Ted, all bundled up in his winter gear, pointing at? It's the completion of our first issue, that's what! There's still lots to do, but this is a giant leap forward in the progress of this book. Duane really is a fantastic artist as I'm sure you'll all see, eventually. "Eventually", by the way, just got a lot closer as of this past weekend. As I'm sure it's terribly obvious, I collect lots of comics, but there are only a few that I will spend time and money hunting down. My real obsession lies with the Fantastic Four, and it's one of my goals to one day own every issue (I know...dream big!). I currently have about 470 of the 560 or so total issues, and I'm gaining - I just bought numbers 128 and 129 today (and got 'em for a good deal!). The problem now is that most of the issues remaining on my list are expensive to the point that, where once I could buy five or six issues at a time, I'm now confined to getting one or two every other month or so. I have about a dozen or so between issues 70 and 99, and a handful of earlier ones - 12, 25, 40-42, 48, 51, and the like - but there's still so many more for me to try and grab. For whatever silly reason, I've also taken it upon myself to buy every issue of Marvel's ill-fated 2099 line of books. Since these comics were popular in the early-to-mid 1990s, it's much easier to fill in the runs of these titles, and as such I have all or most of every 2099 series save Ghost Rider (which is, apparently, never on sale). One book that has remained elusive, though, is the issue where they closed up shop on the 2099 line: an oversized book titled 2099: Manifest Destiny. It's either impossible to find or it's impossibly expensive (relative to my desire to own it), and that always equals me not getting the capstone to this little corner of my collection. That is, until last month when I found it on eBay for $6.99. I snatched it up with glee and waited for it to show up at my door. And waited. And waited. And...waited. I eventually wrote to the store from which I bought the book, and they sent back an apologetic e-mail saying they had forgotten to mail it out and would do so as soon as possible. No big deal, I thought...as long as it makes it here, I don't mind the wait. But that was nearly two weeks ago, and I'm starting to worry once again. The thing is, when I lived/went to school in Ohio, I used to physically go to the store that ended up being the seller of the 2099 title. This isn't some faceless seller that I can rail on about; I can put faces to the listings. So what do I do? Send another e-mail? Ask for a refund? Keep waiting patiently? I have no idea. Some books, it seems, just don't want to be found. 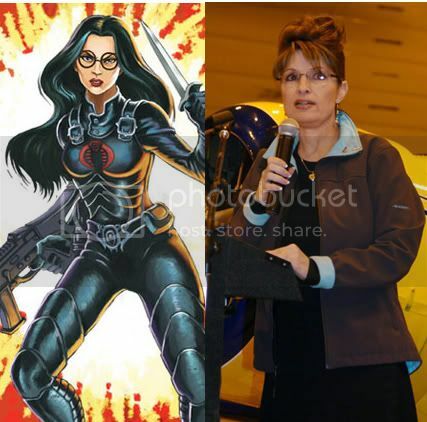 My friend Larry sent this to me...and I have to admit, the resemblance is striking. Also, the preponderance of deadly weapons! Remember when season one was cool? Well, for season three, we present...season one! 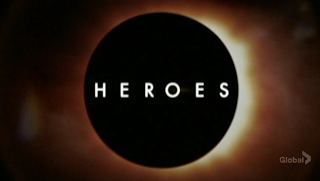 I'll admit that there is something appealing to the show "Heroes". If nothing else, it takes a bunch of really overused comic book plot points and showcases some of the more sensational attributes to an audience larger than any single comic book can hope to entice. I'm not its biggest fan (nor am I of any J.J. Abrams project...which makes me worried about "Star Trek"), but I can at least appreciate the fact that it's an original superhero property, and not just an adaptation of the latest Marvel or DC title. I guess I wasn't alone in hating all that took place in the show's horribly-paced season two, as last week's season premier, in which we got the first two episodes of the new "chapter", pretty much decided to ignore everything that happened after the first season ended. As an outsider, I guess, as someone who has never really been all that drawn into the show (but why watch it then, Jeff? What a good question! ), I find it both a little funny and a little patronizing that they've decided to revive nearly every single plot point from season one. It's like the producers are saying "hey! Remember all that cool stuff that made you watch us in season one? Well...it's just like that, but MORE!" Funny stuff. I guess the ratings for the premier weren't quite what the network was expecting, and that's surprising given how much hype the show has been getting. I guess season two's Wonder-Twin-themed production put more people off than I realized. I find that I have a love-hate relationship with advertisements in comics. I realize that, from an economic standpoint, anyway, they are something of a necessary evil, but I'm looking at this from a strictly aesthetic standpoint. 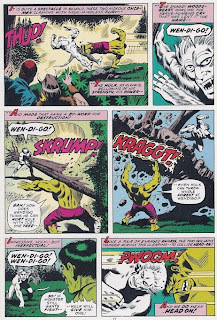 A few years ago, Marvel had big, two-page ads for the Honda CR-V smack dab in the front of their books, which irked me to no end, and before that they had a string of books where the flow of pages was interrupted quite demonstratively by an ad spread. 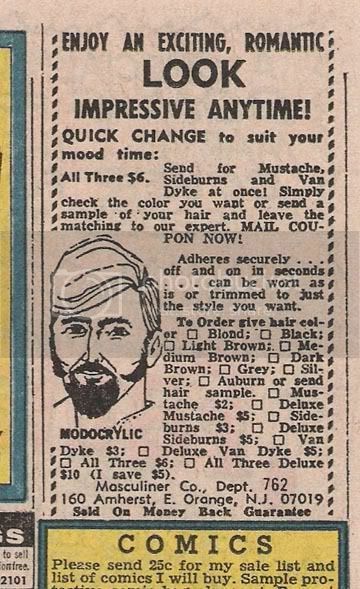 But then I think about all of the back issues I buy, and how amusing the old 2"x3" ad clips for fake mustaches and 'miracle' weight gain are, and suddenly I embrace ads as a part of the fun in collecting - a cultural barometer even more accurate than seeing the Thing and the Human Torch in Beatle wigs on one of those old Strange Tales covers (at least I think it was ST) or JFK dressing up as Superman. "If I can't trust the President of the United States with my secret identity, who can I trust?" Now that we're almost two full issues into the production of Teddy and the Yeti, I'm starting to think about things like page layout and how I'm going to fill those non-story pages. 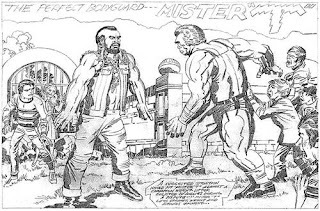 I'm sure I'll throw in some staples like a letters/editorial page, maybe some of those 'anatomy of a page' features, but I keep coming back to advertisements and how fun it'd be to see one of those in my book - almost like a validation that this is a "real" comic book. I honestly don't know how I'd even approach someone about placing an ad in the book, and I especially don't know that anyone would be willing to fork over cash for an ad in an unknown quantity like T&Y. Because I am a nostalgic collector at heart, I'll probably end up trying to give away some ad space to places like the Hero Initiative, a comic book charitable organization that has a real fancy logo. That way, I get what I want - cool ads that make the book feel legitimate without disrupting the story flow. Dibs on the back cover? Line 'em up. Colors! Links! Progress! Exclamation points!! As I've mentioned before, the third issue of Teddy and the Yeti will feature three different, self-contained stories (the cover serves as a fourth story, as well). While it's sometimes true that too many cooks spoil the broth, there will be three colorists involved with this issue, and I've just landed number three. I do this for two reasons - first, it gives Karin, busy in her own right, a reduced workload and more time to spend on the first two issues. Second, it allows for a little bit in the way of different artistic interpretations of our characters, which I think can only be a good thing. 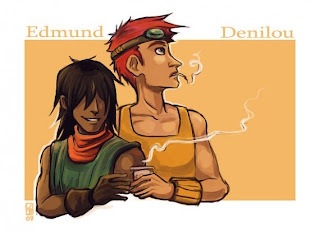 I mean, Duane is still providing all the artwork and I'm writing all the stories, so it's not like there's THAT much in the way of deviation, but hey, it's a compromise. Our third and final colorist for this issue's T&Y stories is Omi Remalante, Jr., who hails all the way from the Philippines, thus increasing our impressive global feel (I think we've covered four continents so far...crazy!) and bringing, I hope you'll agree, some great talent to the book. 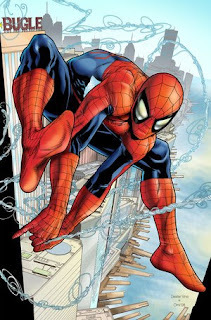 Above is a sample of his work over the pencils and inks of Steve McNiven and Dexter Vines. Where have I heard of those two guys before...? You can also check out more of Omi's colors at http://www.spidey0318.deviantart.com. As always, it's great to see more progress as we push toward our big release date. Where have you gone, NFL Superpro? 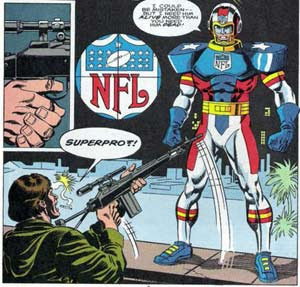 It's not like I'm not used to corporate sponsorship in comic books, but nothing's stands out quite like the short-lived NFL Superpro. I was a little young to get into it at the time it was first published, but now that I've come to be aware of it...man, how did this ever make it to the spinner racks? Now that the 2008 NFL season has begun I've thought a little bit about the NFL Superpro, and on one hand, I wish the character had never existed in the first place. But on the other, I'm just glad that he didn't survive to go through the '90s "grim and gritty" era like so many other books. Could you imagine this guy with guns and stab wounds and a patch over one eye? It was almost to be, I'm sure. I'm not sure how the NFL is received in other parts of the world, but Pittsburgh always gets flipped inside out every time the Steelers play, and I'm not immune to the Sunday ritual in any way. Ever year I think the Steelers will win the Super Bowl, and I've only been right once in my life - so this year, of course, will be a sixth championship for the 76-year-old franchise for sure. I can just feel it! I look forward to going undefeated and crushing all opponents. Just like the NFL Superpro.